Konvertor is a full-featured file manager and converter with built-in viewers to instantly display content, including videos, images, ebooks and more. Simply designed, and fast, Konvertor allows you to efficiently manage files and folders with quick directory navigation, built-in search and ability to view and/or modify file properties and permissions. Use the built-in image viewer, video player, audio player, document reader, text reader, ebook reader, and more. 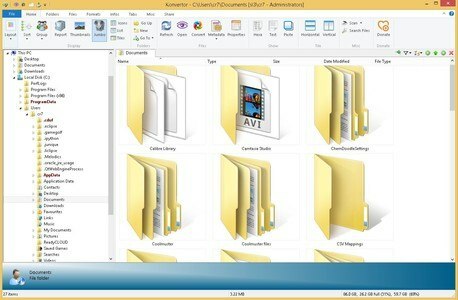 Konvertor is an excellent free alternative to Windows File Explorer. Intuitive Windows File Explorer-like interface. Portable - Operate from USB Drive. View Archives: ZIP, RAR, 7-Zip, TGZ, ARJ, APK, ZOO, LZH, ISO/UDF (and 170 more). Image viewer and editor: Built-in Photo filters and photo effects tools (Supports over 2190 image formats). Audio Player: Listen to over 830 different audio formats, including MP3, MP4, OGG, WAV, etc. Video Player and converter: Play over 230 different video formats, including MP4, DivX, WEBM, VOB, etc. Display and convert 3D formats. Manage, convert, and read ebooks in many different formats. Read text and view documents.